Size : 6.2 x 8.2 inches. / 15.8 x 20.9 cm. Description :Book of Hours (Horae use of Rome) a bi-folio printed page from the Hardouyn Workshop. 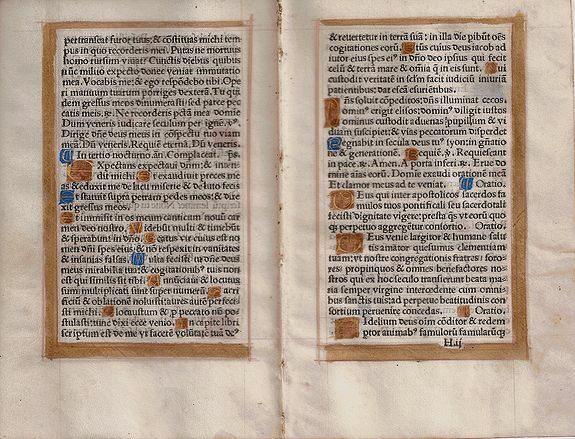 1520 printing:Liquid gold page border. Vellum size approximately 4 ¼ inches by 6 ½ inches. Germain Hardouyn, with his brother Gilles, published editions of the Book of Hours during the Renaissance in France. They published only about 1,000 copies for each edition. The brothers specialized in luxury editions on vellum using hand painted illumination. Because Paris was a stronghold of the trade in manuscripts, the Hardouyns used the art of the illuminator to make his books as beautiful as a scribes work. The main block of text was printed on vellum with spaces left for the scribe and illuminator to finish by hand. The materials used were vellum (made from animal skin), gold in a liquid suspension (thus the term illuminated or from metal) and ground lapis lazuli (used to produce the bright blues still vibrant 500 years later). Like other publishers, Germain participated in all aspects of the book trade, as printer, gilder, illuminator, publisher, and bookseller. Condition : Good condition with one initial on verso rubbed.